On the banks of the River Tay, the Dundee Hilton Hotel is just a 5-minute drive from Dundee Riverside Airport. The hotel features a grill restaurant and a modern health club. The stylish bedrooms at Dundee Hilton each have a flat-screen TV. All rooms feature a work desk, and each has a private bathroom with free toiletries and a hairdryer. LivingWell Health Club features an indoor swimming pool and a fully equipped fitness centre. Guests can relax in the sauna and steam room, and there is also a pretty sun terrace. The Riverfront Bar and Grill serves international cuisine and local specialities, and room service is also available. Caffé Cino offers a range of speciality coffees and freshly baked pastries. 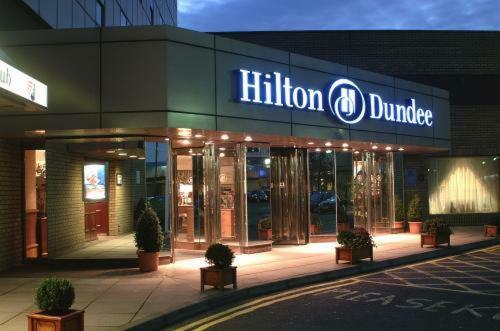 Situated in Dundee city centre, the Hilton Hotel is just 300 metres from Dundee Railway Station. Private on-site parking is available, and Overgate Shopping Centre is a 5-minute walk away.